Hello readers, thanks for checking back with us. Our blog is getting great response and we’re happy to fill you in on our adventures. Just for your information, we were closed on Saturday in observance of Independence Day so it’s especially busy today! Michael and Peter at our Lakewood store are already rocking. That new location is going to get the full LED lit retail sign this week, I’m really excited to see it after it’s installed on Thursday! In fact this weekend, we’re not going anywhere. After so much time on the road I’m finally back in town and I can just going to “reset” myself starting Friday at 5:00pm. I know that it’s only Monday, but just 5 short days until the week is complete for me. Hopefully I’ll be able to get outside and smoke some BBQ on Saturday which equals me sitting around “watching” my Big Green Egg for about 8 hours. Sounds like an easy way to spend a day! More iPhone 6 “Sapphire Glass” discussion. We know that the technology and production is there; companies like Apple are making sapphire screens using manufacturers like GT Advanced Technologies. Apple may limit the use or release the sapphire screens on a limited basis initially; my personal guess is that if Apple unveils the “iWatch”, it WILL have a sapphire crystal screen on it. There might even be a “hybrid” sapphire glass formula a few sources have reported. But heck, I really don’t know for sure. I’m not Apple. It still begs the question: Will customers really fall in love with the sapphire screen? It’s logical that it will be more scratch resistant. That’s good. However I’ve personally owned just about every iPhone and I have never had a “scratched” screen problem. It seems to me (coming from the repair industry) that a scratched screen would most likely mean a cracked screen. There’s little info on how well a large sapphire screen will stand up to a typical “cracking” scenario. I’ve read that sapphire is more brittle than glass and is likely to be more prone to breakage than Gorilla Glass. Time will tell, but personally I’m not sure if I’d spend the extra money on a sapphire “option” quite yet – if there is one coming next week. Hello all! I’m just finishing up on a luncheon for the Mission Repair staff (the brave souls). . .I’m making my world famous meatball sandwiches! Well, they are world famous in “my” world anyway. 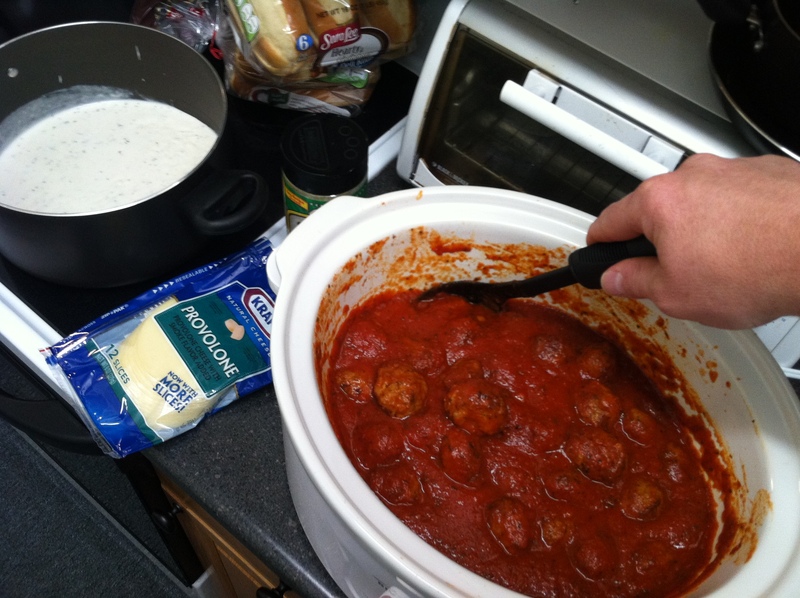 The makings of AMAZING meatball sandwiches. 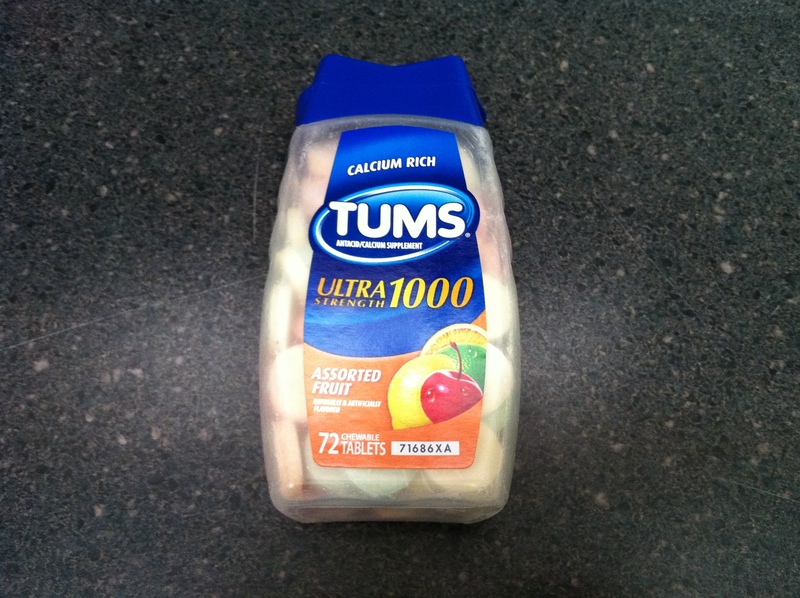 Sometimes Tums are just "needed". Well, it’s fun to have lunch once in a while at the office and I’m happy to be the chef for today. What else is fun? Our latest 15% coupon code that you can use on your iPod repair or iPhone repair today. You just need to call in to our main line 866-638-8402 and ask for Jenny. She’ll give you that coupon code that will be good for 15% off today only (4/15/11). Remember, Jenny leaves the office at 5:00pm central standard time, so don’t miss out! Thanks, I have to head back upstairs to stir my simmering goodness! Yikes, this is what a cracked iPad 2 looks like. Good morning everyone and happy Spring! Did you know that Spring officially started yesterday which means that there is a 100% guarantee that we will not any have more snow this year 😉 well at least until winter comes but we’ve got some time! Here’s the point – these new iPads have THINNER glass. Mission Repair is in the business of repairing cracked glass and we’ve been doing so for years on iPods, iPhones and most new touchscreen smartphones. This new iPad glass is very fragile and sensitive to drops, more than ever before. Take care of that new gadget or call us at Mission Repair where we’re thrilled to help. We’ll get your new favorite electronics back to new and get you back to happiness. Then if you ever break your glass again we’ll repair it again under our “Got Repair” program. It’s the Intelligent Choice. Moving along, have a great Monday!